Middle Hillgate, the area I was most concerned with, was a good shopping centre in those days. The shops I remember, starting from the Covent Gardens and going up Hillgate on the left, were: Brewsters -a cloggers, where I spent many a happy hour in the cellar watching the men making the clogs; the next shop I remember was Godfreys -a newsagent, where I sold papers for three half pence a dozen; Mrs Dooley's cooked meat shop -the smell from there was a meal in itself; Fidler's (brother to Peter) fish and chip shop -still there but no longer Fidler's1; next was an eating house, the name of which I have forgotten but I still remember the two penny worth of rice pudding; Burtons jewellers -he sold wedding rings to more couples than any other jeweller on Hillgate. Jackie Handforth is next on my list; many stories are told about Jackie; the incident I remember was when his shop was on fire when I must have been about eight or nine. The incident I have cause to remember for I received the cane for being late for school after watching the fire. A little higher up was Maben's - confectioners who I always thought had the best chocolates in Stockport; the shop was always nice and clean but the prices were far above my pocket. About September I always joined Maben's Christmas Club but by the- time Christmas came I never had a great sum in it, maybe about tenpence -just enough to buy a chocolate "smokers outfit". Grey's specialised in herb-beer, tobacco, etc. It was a common thing to see on Sunday mornings the men going to Grey's for a glass of herb-beer, a cure for the "hang over" from Saturday night Hervey Banks -chemist always looked sad when serving his customers. Maypole Dairy; here a big man served behind the counter. He was an expert in patting butter and a great favourite with the kids. Ruben's; a Polish Jew, sold Government surplus army boots left over from the first World War. Silverman a Russian Jew was in the same business as Ruben which made the two enemies. Mr. Shallcross herbalist -was never seen without his hat on I believe he was a hatter by trade. Mortons butchers -I remember very little of Mr. Morton, I believe he died early in life, though I do remember Mrs. Morton well. She was always smartly dressed when serving in the shop, Bradbury's -tripe dresser -one could get sausage and mash for fourpence, a favourite supper on Friday and Saturday nights, also one of my favourite places when I was courting. Street's, better known as the London Pie Shop, where pies were really pies, well supplied with gravy. Goodwins pork shop; Mr. Goodwin had his slaughter house at the back of his shop. (After the killing of his pigs the kids in the area went for the pigs' bladders and used them "for footballs. Joe Lowe -grocers -Joe was well known to the people around Hillgate. Marsland's -ironmongers -supplied all the occupants of the cellar dwellings with lamp oil. Wood's -drapers -a small shop, very dark inside. I think many of Wood's customers were of the “club type”. They paid two shillings per week and received a voucher to be spent in the shop. Walton's the barbers where many discussions took place on Saturday afternoons while the customers waited to be shaved. There were many experts on every subject; a pity no one took any notice of them. "Ginty" Booth's eating house has already been mentioned. Knight's -greengrocers was very handy for the kids on Saturday afternoons going to the Star picture. Thompson's pawn shop was well known to the Hooley family. White's - drapers. It was a common sight to see on Monday mornings all the peddlers and hawkers picking up their wares, getting ready for a day's work, Mr. White always looked, and was, a gentleman. Whittaker's -greengrocers -Mr. Whittaker also went out with a horse and cart selling his wares. You could often hear him shouting in the street "one rabbit, five pounds of taters, one pound of onions; the lot, one shilling!”. Primrose Dairy -grocers -was a clean shop, well stocked, kept by a little smart man. His wife was a large woman who was very seldom seen in the shop. Hunt’s upholsterers -their shop and workshop were in the old premises of the disused public house, "Land of Cakes". Mather's - butchers - a small old fashioned shop. Mr. Mather was often seen in his horse and trap. His horse was a lovely animal and much admired. I believe he used to hire it out to theatrical companies that appeared at Stockport Theatre when a horse was needed in any of their plays. Blackshaw's -bakers well known all over Stockport and the last shop to celebrate "Old Cheadle Wakes". Felstead's -a hairdressers and newsagent was a very old shop with a high counter. Old Mrs. Felstead had a bad temper. I don't think she had any love for boys -she had a glare in her eyes that reduced them down to six inches. Shaw's -grocers -a favourite place for cheap cracked eggs, well patronized by the people of Hillgate. Briggs -a cycle dealer -where one could get a bike on the "never'" for two shillings per week. Bray's confectioners –one of my favourite shops. Bray's rice cakes were out of this world; only a penny but what a treat! Waterhouse's -saddler. This shop seemed out of place on Hillgate. Gifford's grocers. One of the old grocer’s shops with hams and bacon hung up on beams, meal oats and flour sold loose and always a smell of coffee in the air. There were chairs in the shop where the women could sit down and have a gossip. Mr. Gifford was a tall thin man who seldom smiled. No doubt there were other shops that I have missed out but the ones I have mentioned are the ones that stand out in my memory and the ones I was associated with. It was a grand sight to go down Hillgate at night time with all the shops lit up, most of them exhibiting their goods outside the shop. The greengrocers had oranges, apples and vegetables all looking clean and nice to eat. 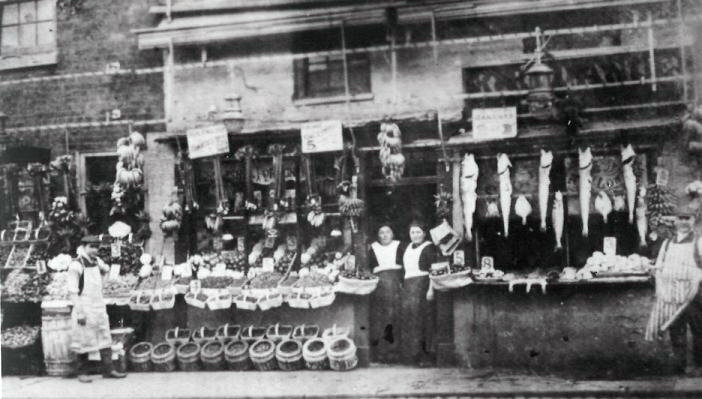 The grocers had crates of eggs outside showing prices and the quality; duck eggs, hen's eggs, farm eggs and the old stand by, Egyptian eggs for sixpence per dozen -out of every dozen four were bad. Christmas time was always the best time to see these shops. The greengrocers would hang out side the shops fowls, chickens, ducks, geese and turkeys. I cannot recollect having anything like that for my Christmas dinner when I was young; the nearest to any fowl we got was the "giblets" for our dinner. If you had an account (tick book) at the local grocers shop, the shopkeeper would, at Christmas, give you a Christmas box; maybe a cake or a box of sweets for being a good customer. I am afraid our family never qualified for that. Christmas toys for the kids in our family consisted of a "half a crown" parcel from Hallworth's in Underbank. Hallworth's was a large store situated at the bottom of Hillgate and it was their custom at Christmas time to make up parcels containing cheap toys and price them at 1/6d, 2/6d and 5/-d. Part of the enjoyment was to see what the parcel contained when you got it home. My vagabond friends and I always formed a choir about Christmas time. The qualifications for membership were to know the words of the carols we were to sing. We would number about four or five, our ages averaging 11 or 12. We knew we were good so no practice was needed. On. Christmas Eve we would set off to give the people in their homes and clubs the pleasure and benefit of the magic of our beautiful voices. On one of these occasions we were singing our carols outside a house in a yard off James Leach Street. After giving our concert of three carols and a "very merry Christmas", our treasurer knocked on the door for our reward. No-one came to the door, although the house light was one, he knocked again, a little louder but to no avail. A man from next door came out to us, drunk, and told us we would have to sing louder for the man who occupied the house had been dead for three days and was being buried the next day. It was voted amongst the choir, he had done us a dirty trick -he should have died after Christmas. The last club was Dundonald Street where we struck it rich. We stood outside and gave two carols. A man came out, drunk. We kids were prepared to duck or run but no. He invited us in. Here was a music loving "blue", or was he too drunk to know what he was doing? However in we went and on the stage of all places we gave our three carols and ended up with a popular song of the day "let the Rest of the World go by." .I am sure the sober members o f the audience wished vie had gone by! We must have looked like displaced persons from a prison camp, with our broken clogs, big caps and jackets two sizes too big. I am sure our appearance or that stage would have helped Karl Marx far more than all his writings. However, the money reward for our singing came up to expectations; a good collection for us kids was made from the members, which sent us on our way happy with our lot, and a vote was taken that the "blues" were indeed a music loving crowd. At the age of twelve I became a “lather" boy in a barbers shop on Edward Street, Hillgate, working from 4.30 Friday afternoon until 9 o’ clock at night and from 9 o'clock Saturday morning until 9 o'clock at night. The wages were four shillings per week. The shop was very old. The entrance was down two stone steps making the whole room very dark. The room contained two barbers chairs and wooden forms placed round the wall for waiting customers. My job was to lather the men's faces for the shave the barber was going to give them. I must say it was not very hygienic for most of the customers came from the common lodging house on Ridgway Lane. On Friday and Saturday nights most of the men were drunk and the fumes from their breath made "me think I had spent half the night in a brewery. At Christmas time the barber placed a wooden box on the counter. On it he wrote "don't forget the boy, he tried to do his job proper, don't forget his Christmas copper". By New Year’s Day I should have written on the box -"You miserable sods, I tried to do my job proper and you have forgotten my Christmas copper". When my fourteenth birthday came along I was ready to leave school and join the great big world outside. There was one consolation; after being brought up on Hillgate you were prepared for the life in front of you! In three years I had many jobs and strange to say, in most of the jobs the employer would say I was too old and I would have to leave. Of course, there was a method in this, I was becoming a man, and at eighteen would want a man's wage so it was cheaper to dismiss a youth and engage a younger boy. This was how the economics of the country was run in those days. In the 1930's this unemployed youth signed on at the Unemployment Exchange in the normal way and received the dole money which I believe was twelve shillings. Later, unemployed boys and girls had to attend classes five half days a week at Hanover School at the bottom of Lancashire Hill. The classes they attended were only to keep them occupied; woodwork, etc., for boys and dressmaking, etc., for girls. I attended there for about five weeks until I became eighteen. About this time I became interested in a girl who lived on Higher Hillgate, the daughter of a master butcher. Her name was Sadie Harrop and she was a gent’s hat trimmer working at Christy's. We had met once or twice at local dances and at night school. In a short time we began "courting" which lasted seven years. I don't think I was very popular with her father because of the area which I came from. The future wasn't bright for us because of the work situation; both of us were more out of work than we were in. The courting days (or nights) consisted of going to the Star pictures on Monday nights and having two cups of Oxo and a cream cracker each when we came out at Jones the herbalist on Hillgate. The cost of the evening was 1/4d (7p). On Friday nights we would hit the high spots and have two plates of sausage and mash at Bradbury's Tripe Shop on Hillgate after we came out of the pictures. The financial output was two shillings or two shillings and six pence, (10-12 1/2p). Things did get better later. 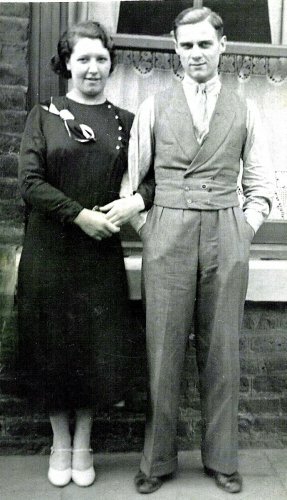 We were married in 1938 and lived in a little house in Swallow Street, Higher Hillgate. In 1939, like millions of others, I went to war and so my story of Hillgate comes to an end. As I began with a war, so I shall finish with a war. I am only glad I belong to a generation that remembers Hillgate in its' hey day and I must say there's not many of us left. Of happy nights and stories told. It is then, we know, we are getting old". 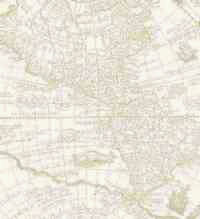 Images of England, Stockport - compiled by Morris Garratt and Shirley McKenna. pub Tempus Publishing Ltd 1999. Reprinted 2001. I am not aware of breaching any copyright on these images, but if anyone is aware that this may be the case please contact me.